Not too far down the beach from where we stay in Puerto Vallarta is a Mexican stand where they grill fish and shrimp to sell on the beach. 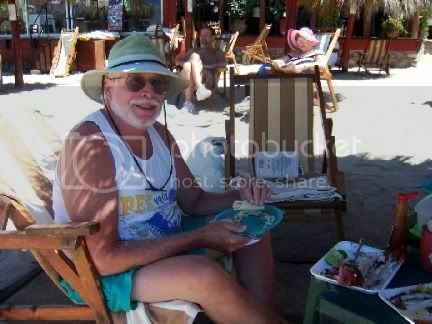 It is also a popular place for the vendors to stop and have lunch. It is largely a family affair and has been in the same family for at least two generations that I know of. The woman running it now took over after her mother died a few years back. 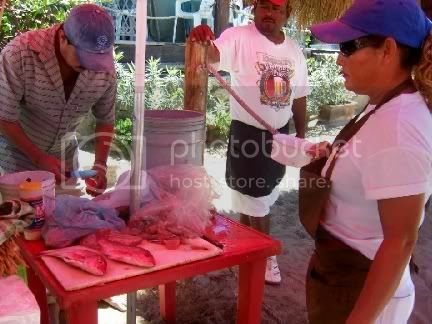 If you ask a couple of days in advance they will buy whole red snappers and cook them over the coals for you. This used to be much more common in the past, but you don't see it too much anymore. We ordered two of them on Sunday and said we would like to have them at 1:00 P.M. on Monday for lunch. "No Problemo" she said. Well late Monday morning she hadn't begun to set up yet and everyone was wondering if she had the day off, was partying too late the night before, did she forget, or what? Oh we of little faith. 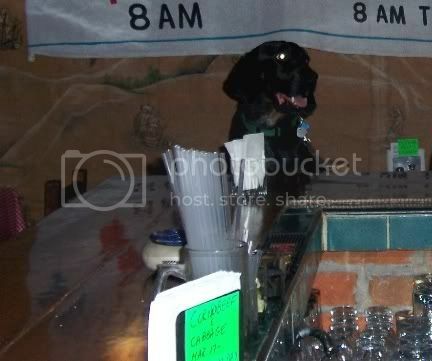 About 11:00 A.M. she started to set up shop. 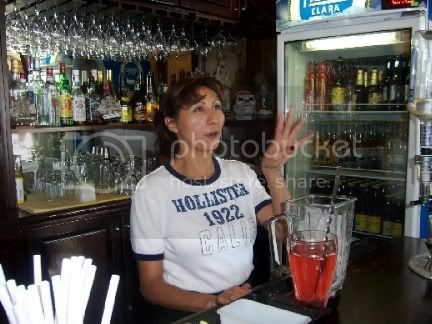 A bit later than usual, perhaps, but hey, it is Mexico and she is her own boss. 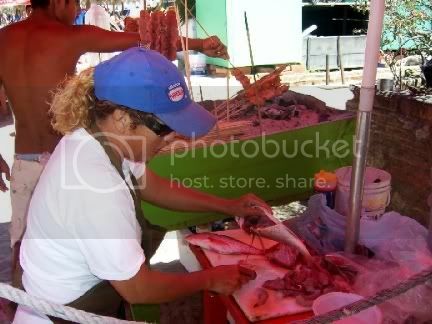 After setting up a bunch of the fish filets and shrimp on sticks to sell on the beach she broke out the snappers. She then scaled and cleaned them and added whatever spice mixture she uses. 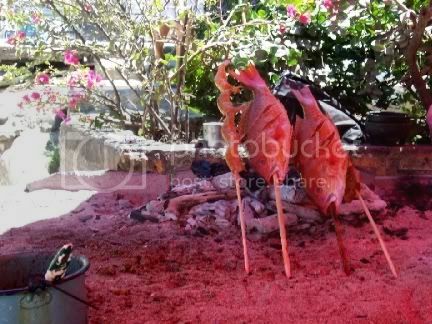 And before long they were on the sticks and over the coals. 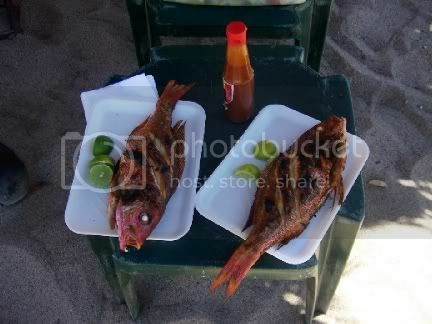 A short while latter they were done and delivered to our little table on the beach, complete with fresh limons to squeeze over them and a bottle of hot sauce for those who wished to spice them up a bit. Needless to say they were delicious, and fresher fish you just cannot get. Easily as good as any of the restaurant fare and at a little less than $9 each a real bargain. 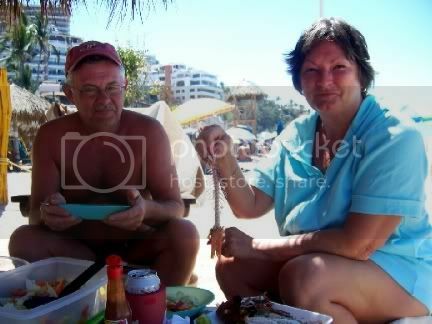 Sandy and Rico ate their's to the bone in no time flat. I settled in to enjoy mine as well. 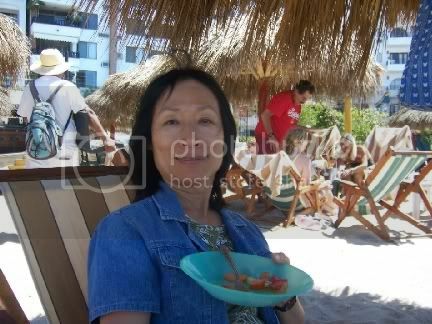 And the Mysterious Chinese Woman wasn't far behind. All and all it was another memorable meal. What is a bit sad and somewhat indicative of the mindset of a lot of vacationers here is that many of them actually wanted this stand to be removed from the beach because it detracted from their version of paradise. 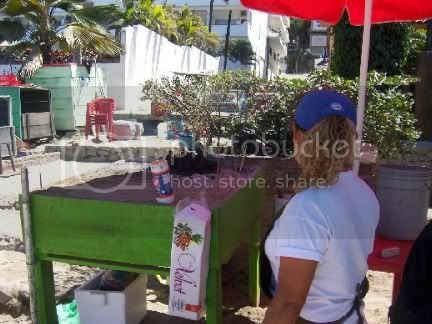 I mean, Who wants a little stand run by Mexicans where the vendors can gather and have lunch located so close to your beach chairs and unbrellas? 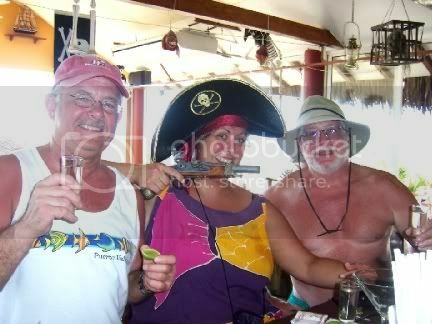 Ironic, because these are the same people who complain if the city makes any changes that are deemed to be changing Puerto Vallarta from the simple little fishing village it once was but benefit the residents who live here all year round. Go figure. I guess they would be happier if only the tourists could drive cars and ride in tour buses but the locals all had to use donkies. 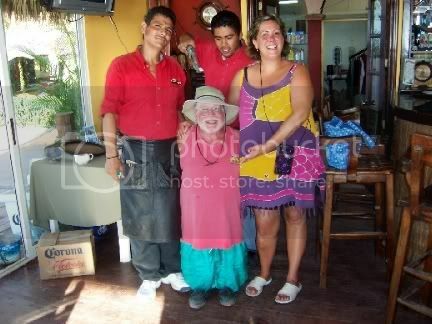 After our little episode at El Pirata (it was all Alison's fault) some of us headed out to Senor Sweeny's for dinner. 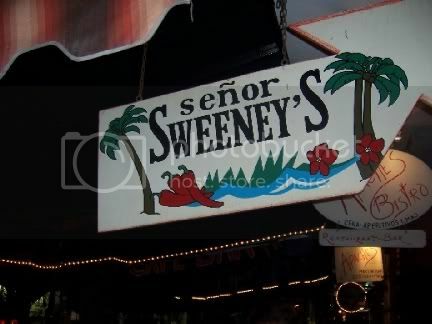 Senor Sweeny's is an upstairs place, not very large, that you get through by entering a narrow doorway and going up an equally narrow staircase. Sweeny is from my neck of the woods, or what used to be my neck of the woods. He has a bar in St. Paul, twin city to Minneapolis where I grew up. 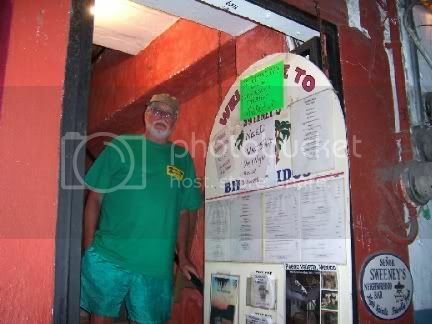 This is one of my favorite places here in Puerto Vallarta. During the day it is a nice spot for a cold beer. 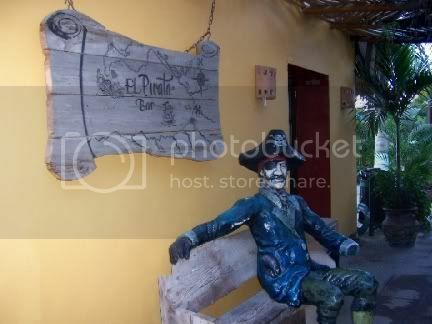 You can sit on the balcony and overlook the main drag of the town on this side of the Rio Cuale. 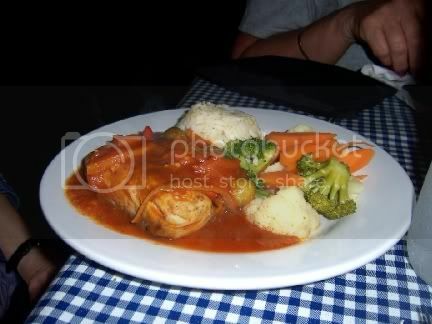 In the evening you can get a very good meal for a very reasonable price. The Porter House of Pork is the best pork chop in town. People line up for the Spaghetti Special on, I believe, Friday's. They have a Cheap Charlie's Shrimp Cocktail that people rave about. 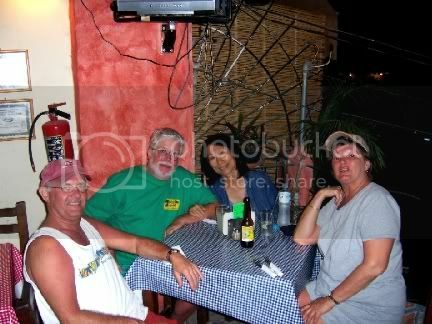 As you probably know by now, that is Rico, Yours Truly, the Mysterious Chinese Woman, and Sandy sitting around the table. The Mysterious Chinese Woman had the Mahi Mahi in Veracruz sauce, generous portion and quite tasty. 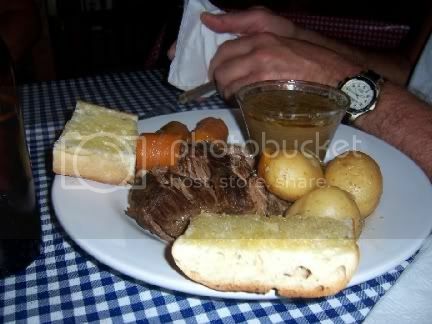 Rico opted for the Yankee Pot Roast which was the daily special. 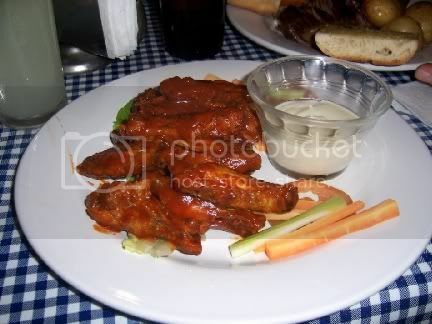 Sandy and I each got Spicy Chicken Wings, quite delicioso. 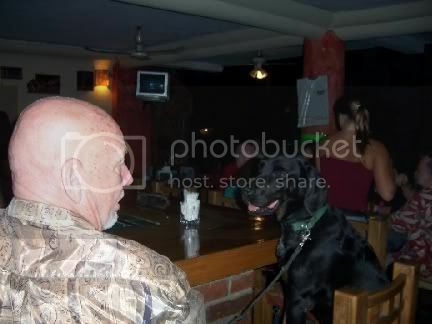 There is always a decent crowd in here in the evenings, but sometimes you will see a few dogs at the bar. But, at the end of the night and after a few drinks, everyone looks good to someone. They will probably both end up in the doghouse tomorrow. We spent a nice leisurely day at the beach so I thought I would include this gratuitous picture just to get your attention. I am sure you would have all preferred to see Sandy and the Mysterious Chinese Woman in their bathing suits, but I guess you will just have to wait. They were being much too modest. 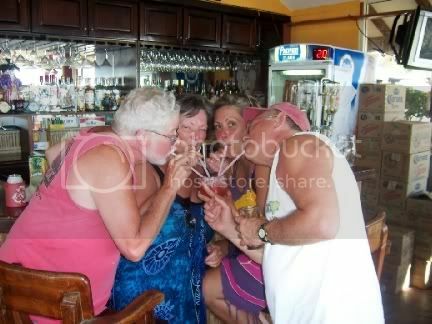 Anyway, we were simply soaking up the sun and having a few beers when our good friend Alison appeared with a pitcher of one of her specialty drinks, Chunkie Monkies. This was not good because they are not only delicious, they are deadly. Sadly I didn't get any pictures of this little treat, but no matter, there was more to come. After polishing off the Chunkie Monkies and already feeling no pain we decided to head upstairs and, perhaps, take a bit of a nap before heading out for dinner. 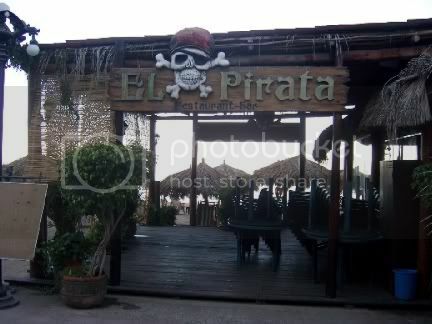 Alas, standing between us and our destination was the El Pirata Bar. Unfortunately for us, this guy wasn't the only one waiting for us. Inside dear friend Alison was awaiting us with shots of tequila. As you can see, we were in no position to turn her down. 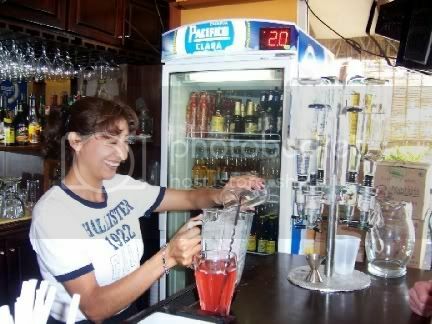 Then, Alison being a well trained and highly professional bartender, the lovely bartender Mara was given instructions on how to make something called a Sinful Cindy or something like that. You can see her reaction as the list of ingredients began piling up. And Then You Add What? Of course you know this concoction would have a fair amount of booze in it. And when it was over we all partook. Of course after a few of these there was nothing left to do but my world famous dwarf impersonation. We even got one of the waiters, Raphael, to join in the fun. After way to many Sinful Cindys or whatever they were we decided to head to Sweeny's for dinner. Last time I was there I bought one of his 2008 St. Patrick's Day shirts so I decided to wear that before sneaking out of my leprechaun lair. Stay tuned because I will be posting more on our night at Sweeny's shortly.